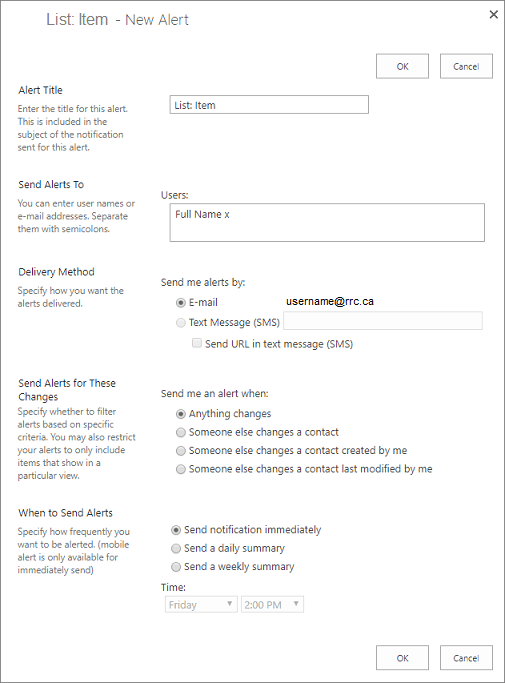 Alerts are an effective way to keep track of your information. You can create Alerts for entire libraries and lists or their individual files and items. You will receive an email with an alert when something new is added, an item is edited, or a file is deleted. 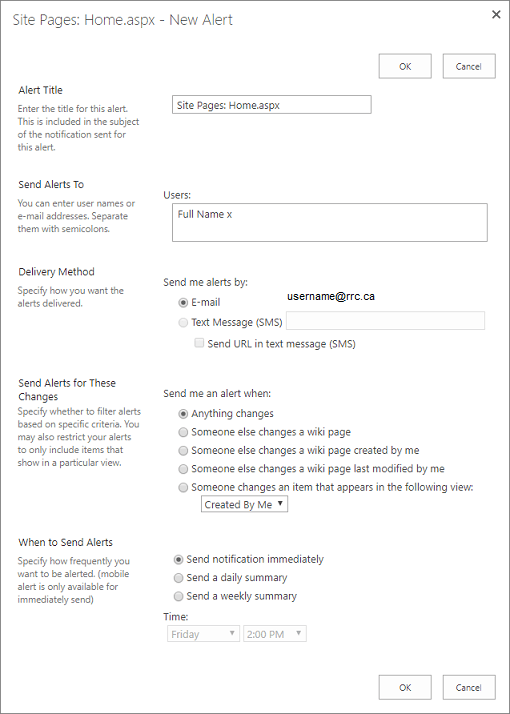 In combination with versioning, Alerts are a good way to ensure that your team site documentation remains current and up to date. Refer to the Set up versioning page for more information. Open the library where you would like to set an alert. On the Library tab, click Alert Me, and then select Set alert on this library. Choose from the alert options available, and then click OK.
Open the library where you would like to set an alert on an individual file. Hover your cursor next to the document, and then click it. On the Files tab, click Alert Me, and then select Set alert on this document. Open the list where you would like to set an alert. On the List tab, click Alert Me, and then select Set alert on this list. Open the list where you would like to set an alert on an individual item. Hover your cursor next to the item, and then click it. On the Items tab, click Alert Me, and then select Set alert on this item. On your home page, on the Page tab, click Alert Me, and then select Set an alert on this page. 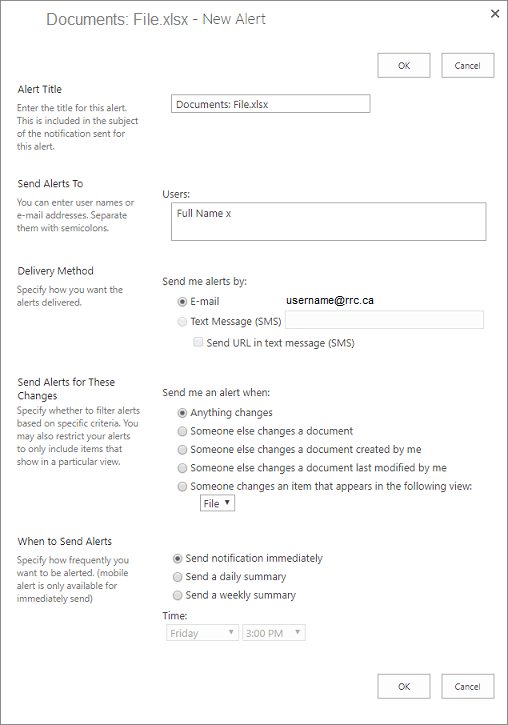 You can view and manage your existing alerts directly from your team site home page or from within a library or list using Manage My Alerts. On the Library tab, click Alert Me, and then select Manage My Alerts. When the list of all your libraries and lists opens, click the radio button next to the library or list that you would like to set an alert for, and then click Next. When the library or list alert options open, choose the appropriate alert functionality that you would like for this specific alert. NOTE: The image above demonstrates the process using the Library tab, but it will look the same for a list or the home page. 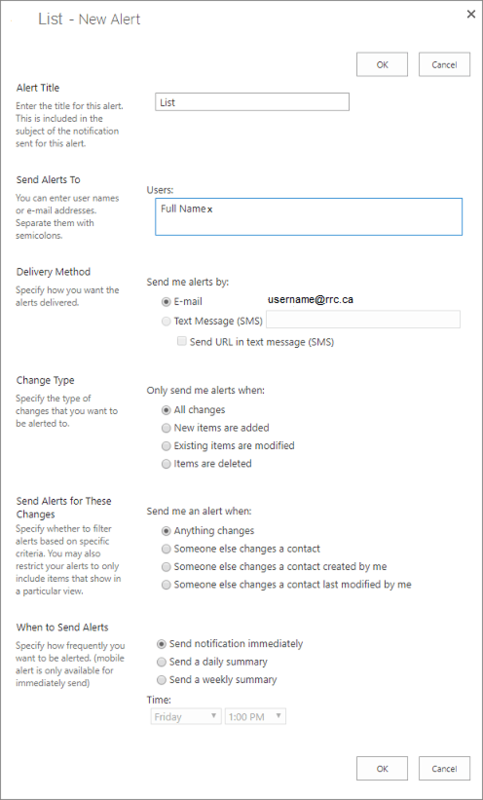 For a list, on the List tab, click Alert Me, and then select Manage My Alerts. For the home page, on the Page tab, click Alert Me, and then select Manage My Alerts. Select the check boxes of the alerts you would like to delete, and then click Delete Selected Alerts. You will receive a message indicating that you are about to delete the selected alerts, click OK to proceed. 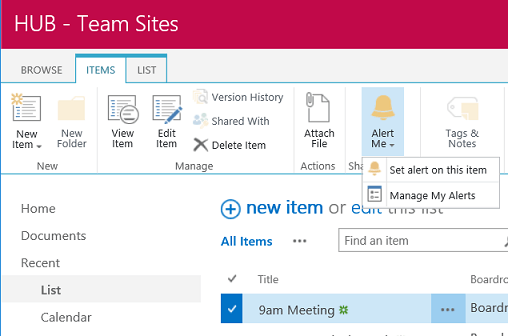 On the Home tab, click Rules, and then select Manage Rules & Alerts in the drop‑down menu. 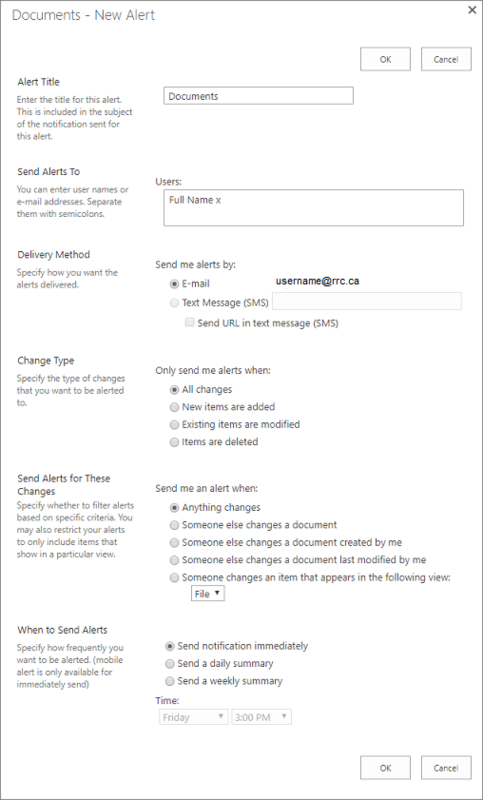 On the Rules and Alerts menu, click the alert you want to remove to highlight it, click Delete, and then click OK.
On the Microsoft Outlook message window, click Yes to delete the selected rows.